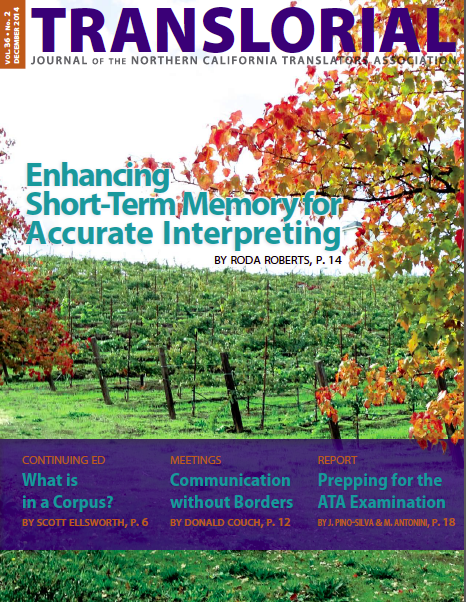 A corpus can be a great tool for translators, as one NCTA member found after attending the NCTA-hosted webinar on the creation and use of language corpora. Medical interpreters who wish to be certified have a choice between programs, but they’re not all the same. Carlos Garcia presented the pros and cons of each. Just what is localization? Jose Palomares unraveled the mysteries of this market in flux for NCTA members attending his August seminar. NCTA’s general meeting on May 10, 2014, featured an excellent presentation by Dagmar Dolatschko, founder and president of Peritus Language Services, on the importance of first impressions. Localization expert Kat Momoi reflects on the incept and trajectory of localization, and the events that inspired his involvement. Short-term memory is essential for successful interpreting, and routine practice of a few simple exercises can greatly improve memory function. inside scoop at an NCTA workshop held by Sean Dodd. translorial posted this article under Business Tools, Continuing Ed., Interpretation, Localization, NCTA Events, NCTA Meetings, Reference, Reviews	on Monday, December 1st, 2014 at 6:04 pm	You can follow any responses to this entry through the RSS 2.0 feed. Both comments and pings are currently closed.